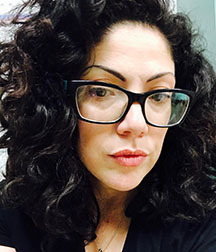 Today, we have an interview with Vickie Fernandez, runner-up winner in the Quarter 1 Creative Nonfiction Essay Contest, with her essay, "The Other Half of the Sky." If you haven't read it yet, read it here. Vickie Fernandez is a writer, storyteller and comedian. After a short hiatus from creating word things to fall in love, make a human thing and learn how to excavate her souls tales sober, she’s hitting the keys once again. Her stories are often raw and painful to pen but delicious to read and there are plenty of woeful tales to sink into. Vickie cut her story weaving teeth in Ariel Gore’s Literary Kitchen. Her stories have appeared in various literary journals including Akashic Books, Carnival Literary Magazine Vol. 3, Penduline Press, and The Rumpus. Vickie is also proud to have contributed stories to the Two-Countries: US Daughters & Sons of Immigrant Parents Anthology as well as The People’s Apocalypse. She’s currently working tirelessly on a new batch of stories (and cookies) while balancing raising a toddler, being a wife, and tiptoeing back to her writer self, one word at a time. For more about Vickie or to support her creative journey, visit her at: Patreon: https://www.patreon.com/user?u=8872117 or Casual Cry Days: fernandezvickie.wordpress.com . WOW: Vickie, congratulations on your essay placing as a runner-up. Your essay deals with a mother's illness, which is obviously very personal to you. How was it to write this piece? Vickie: Thank you so much, Margo. I'm so unbelievably flattered that I made the top 10. Words have always symbolized freedom from anguish to me. I've spent my entire life finding beautiful ways to say terrible things. I've been writing and re-writing that story my entire life. My mom was only 28 when she was diagnosed with cancer and she died when she was 30. At the time, I wasn't really aware of the permanence of death because I was a kid and I was preoccupied with the things 10-year-olds are preoccupied with. I was however, grateful that she had stopped suffering and I honestly thought that life would magically go back to the way that it was before she got sick. But obviously I it never did. My mother's illness and death signified a huge turning point in my life and it was a catalyst to a great deal of trauma that came after. I started drinking when I was 11 years old, and I basically numbed myself to all of the things that had occurred in my life up until I got sober three years ago. I think that my ability to look at the truth of my childhood and everything that came after and being able to put it into words that others can relate to and enjoy is one of the things that pushes me to expel them. While at the same time seeing beauty in a seemingly painful past. Though I wish I'd had my mom around, I wouldn't be the person or the writer that I am had it not been for all those tragedies. WOW: Thank you so much for sharing your personal journey with us. That takes a lot of courage. We are so glad you decided to enter the contest. Do you write a lot of essays? Why or why not? Vickie: I really enjoy writing essays and short stories. Though I am not opposed to longer works, I like how you can distill powerful moments into short pieces. Doing storytelling and stand-up comedy for a few years helped to make my writing succinct. Stand-up helped my writing particularly because you have very little time to a evoke certain feelings from an audience. Now, I go back and I look at my old essays through that lens and am able to slaughter a lot of darlings! I have to say, it feels really good to trim the fat off of a piece and give it a sort of punch of poignancy. WOW: Oh my gosh, that is so true! Your bio states that you are recently getting back into the writing habit. How is that going? Vickie: Well, it's going. It's really difficult to write with a toddler in toe. But I do what I can and I don't beat myself up for what I don't do. I spent a lot of time feeling guilty about what I wasn't writing and it stopped being fun. I am a writer, it is who I am. Sometimes I do it a lot sometimes I don't do it at all and that's just how I have to look at it. Becoming a mom has changed my perspective on how I look at everything. I do what I can and I'm grateful for anything that I manage produce. WOW: You have the best attitude when it comes to writing with kids. Do what you can and don't beat yourself up! What are some challenges you have overcome as a writer? Vickie: I would have to say time, energy, and too many ideas. I'm not a procrastinator so much as I am an over-thinker. I have a lot of stories, and I get overwhelmed by the urgency to get them out. WOW: That's great! What is your current project? What's next for you? Vickie: At the moment, I'm working on some short stories. My focus is memoir and creative nonfiction. I just want to put my work out into the world in anyway possible. Maybe someone will read something that I wrote and feel that jolt of connection to my words that I feel when I read the work of my favorite authors. That would awesome! WOW: That would be awesome! Thank you again for your time spent talking with us. Best of luck to you! Thank you for the interview, Margo! Vickie ~ I relate to your personal journey. My mom died when I was thirteen (geez, ten is really tough), and I also turned to drinking and, ahem, other substances to numb the pain. Your essay captures the essence of sadness, love/missing her, and a certain helplessness of being unable to do anything about it. There will always be so many unanswered questions. The scene with your mom staring into the moonlight at the gas station just hit me so hard. It's so vivid. And I can't imagine a more perfect last sentence. Simply gorgeous. Hugs! :) I agree with you when you said that you wouldn't be the person or writer had it not been for all those tragedies. I started writing because of what happened with my mom, and it still provides me with comfort. I'm an over-thinker, too. It can be immobilizing sometimes. And hey, I definitely felt a jolt of connection to your words, so thank you! :) I look forward to reading more from you! Vickie--I did not lose my mother at a young age, but you gave me a window into what it was like. Thank you for having the courage to write honestly about difficult things. Your story will--I'm sure--inspire others to tell their story. And good luck with your short stories/memoir. Memoir is my favorite genre to read, so I look forward to reading your book when (not if) it gets published.